Ya, really g8 fone, Watched a demo on utube the other day, I was astonished to c the different features.. A must-have phone but i dont think we mauritians will have it soon and i bet its price will b far more expensive that any smart fine. however, i think, we should give some time before judging it, but am sure, apple has done a good job. 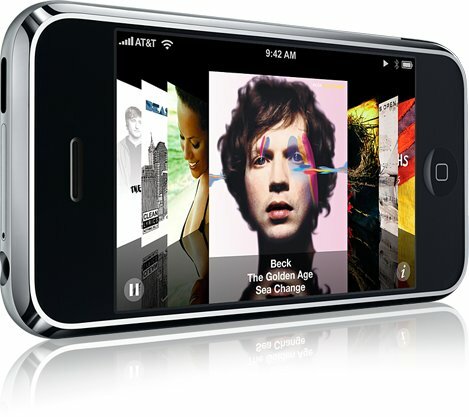 It’s rumored that the iPhone will be shortly released (with 3G!) in Europe in a few days. I think this is the kind of iPhone that we might have here in Mauritius (albeit at a prohibitive price). i watched the video, just WONDERFUL. I specially liked the way you can delete things in it, just swipe your finger on what you want, it just ask you for a confirmation for deletion automatically, :p there was lots of hci behind this, it does it in a soo natural way. 1. The iPhone was launched on the east coast of the US first, followed by timezones further west (ie at 1800 New York time, then 1800 Midwest time, then 1800 Mountain Time, then 1800 Pacific time). watching our usage graphs was very interesting! Product: good form factor. Good ease of use. You get feedback for everything. Let’s say you tried to drag the weather widget up and down (instead of left/right to see the next widget). The widget would “bounce”, so you’d know you’ve done something unsupported. Little touches like that make it very special. Ease of use: The touch screen keyboard is easy to use and works well. You have to “aim” the centre of your thumb on the key you want to press. Let’s say you type in “PIZZ”. The “A” key automatically grows larger! Love it! Widgets: The widgets on the home page look IDENTICAL to Dashboard’s. Visual voicemail: just like Skype voicemail: all random access and cool. Call quality: Poor to fair :( At best, sounds loud but metallic. I’ve had colleagues calling me with severe dropout. Well i need some information from you regarding the Apple iphone. I would like to know if that phone is available in Mauritius and the place where i can find it. Please its urgant waiting for your quick reply. U can also mail me plz. As far as I know, it’s not being sold right now in Mauritius. Maybe you could ask someone from LCI. Like it or hate it, the truth is that the iPhone is one the BIGGEST FLOP of the decade. Use it before trying to automatically praise this piece of crap from Apple. I understand Steve Job lovers would say it’s superb before using it even if it was the same thing as a 3310. But the fact is….the iPhone is just plain bad, has nothing revolutionary and in terms of simple thing like call quality it sets the advancement of mobile communication back to 10 years. It will take a century if Apple wants to surpass Nokia, Samsung or even LG in Mobile phones, but I guess that’s not their objectives. First of all, I’ve never touched an iPhone so I can’t really comment on the usability compared to the Nokias I own. What I know is that (i) many reviewers praise the iPhone and (ii) more than one million have been sold already. I would love to try one though just to make my own opinion. By the way, what do you really mean in your last sentence about Apple’s objective? I might seem some stupid, but I want the real “Locked” phone which might(someday, someyears) be launched by one of the local operators; probably at Rs 26000(contract free) by Cellplus as its the local Orange operator. I think that right now, there are : Three unlocked iphones being used with mauritian sim card. One has been sold by a shop in belle-rose(thats just a rumour, I don’t believe it). But there are two unlocked phones imported straight from a mauritian contact in the US. That’s 100% true as I have a collegue who already has one! Payed huge: Rs38000, shipping included. That’s why I think that it would be wiser to wait and see if emtel or Cell+ launches it. Will be sold at But will they charge the 1.3x tax Apple has imposed? Means that a text message will be ~80cents instead of 60. Abt pierre: Don’t compare the Iphone with Nokia, samsung, LG… they just don’t play in the same playground. Its simply not-comparable with other phonebrands. Hi! There’s a friend of mine who’s in Hong Kong at the moment. She said she could get me an Iphone at a very good price. But I really don’t know whether I can use it with either Cell+ of Emtel. Another thing, is is safe to buy if from Hong Kong? Please advise. I’m considering buying an iPhone from UK. But will I be able to use it here in Mauritius with a cellplus sim card? And what’s the difference between an unlocked and locked phone? I know this is a pretty basic question, but I’m knew to all this technology. Sorry for the typo, i meant ‘new’, not ‘knew’. I don’t know a lot about cellphones but I would say that a locked phone only works with a limited number of operators. Obviously, an unlocked phone will work with any operator. So if you want your iPhone to work with Cellplus, you better get an unlocked version! does anyone know if it is safe to buy an unlocked iPhone on ebay with sellers with ship internationally??? I badly want 1 and the prices they show over the net are in my budget range but i’m getting scared of buying on ebay. i hav 1 unlocked and thinking of selling it wats ur budget? My budget USD 600. This atleast Rs 16000. Is it new?? Where did u get it from? yep its new gt it from Hong kong well Rs16000 is a bit low cuse i paid mind Rs29000 i ll sell it at Rs20000 cuse its only 1 month old. I’m sorry, but i don’t think u’ll get a fool around here to buy iPhone at this price. U know why, bcoz in curepipe they’ve selling it at Rs 19000, new, unlocked, and i think with guarantee too. And in Rose Hill it’s Rs 20000. But still i find it too expensive as in the US it is 400 dollars. This is approximately Rs 11000. If prices stay up here in Mauritius, i think i’ll be contacting my mates in US and UAE to send me one. I guess it will be an exclusivity to Orange & (hopefully) with some unlimited data plans. But the iPhone’s really easy to unlock if you want to stay with Emtel user. hey don’t wanna wait??? No prob, they are being sold at crepipe. i myself got one there. it’s working fine as it was already unlocked and jailbroken at the shop. don’t be afraid to get one there, they are good. did not experience any problem till now. when will the Iphone 3g launch in Mauritius? hope it will last ? What is the use of an iPhone when Mauritius cannot buy professional applications from Apple stores ? I have an iPhone 3G 16 giggs and without professional applications, my iPhone is as good as an ordinary phone or worse. Safari cannot download nothing. My iPhone email cannot create folders to help categorise my mails. I cannot attach pdf or Excel files in my iPhone mails. So is this a GREAT BUSINESS PHONE ? Who can help ? Thank you. Thought I’d leave my impressions on the iPhone 3G-S, that I saw on Friday. 3. Slightly faster, when loading Google Maps, etc. Verdict: save your money. Marginal evolution, not revolution. The only benefits for me were the autofocus camera that allows clear photos of whiteboards and documents, and possible HSDPA speeds (though AT&T is not rolling these out until later this year in the US, and NOT allowing iPhone tethering). Not worth spending money on.